SPACEPORT NEWS November 26, 1999 Page 2 Hubble ...(Continued from Page 1)In the Vehicle Assembly Building, Ken Strite of NASA Quality Control inspects the connection between the Space Shuttle Discovery and the external tank that will be used to launch mission STS-103 in early December. This 10-day mission is designed to replace aging parts on the nine-year-old Hubble Space Telescope and to upgrade some of its functioning systems. During the flight, the astronaut crew will replace all six of the observatory's gyroscopes, a fine guidance sensor, its main computer, and other equipment.mander. Pilot Scott J. Kelly will make his first space flight, while the remaining five astronauts all have previous Shuttle experience. With the recent failure of a fourth gyroscope on Hubble, the telescope was no longer able to gather data and was placed into a safe, or non-operational mode. The servicing of Hubble will occur during four planned spacewalks involving payload commander Steven L. Smith and mission specialists C. Michael Foale, John M. Grunsfeld and Claude Nicollier. The launch of STS-103 will close the longest period without a Shuttle flight since the period following the Challenger accident in 1986. The previous mission, STS-93, landed on July 27. An electrical short during that mission led to thorough wiring inspections for all four orbiters. With the wiring inspections completed, Discovery rolled out to Launch Pad 39B on Nov. 13. The crew took part in the Terminal Countdown Demonstration Test on Nov. 16 and 17. During a question-and-answer session with reporters, Brown and his crew expressed their eagerness to complete the mission. In addition to replacing all six gyroscopes, the crew will replace a guidance sensor and the spacecrafts computer. The new computer will reduce the burden of flight software maintenance and significantly lower costs. In addition, a voltage/temperature kit will be installed to protect spacecraft batteries from overcharging and overheating when the spacecraft goes into safe mode. A new transmitter will replace a failed spare currently aboard the spacecraft, and a spare solid state recorder will be installed to allow efficient handling of highvolume data. Both missions will replace telescope insulation that has deteriorated. The insulation is necessary to control the internal temperature on the observatory. The mission was announced in March. Though the time between announcement and launch is a relatively short nine months, Brown has no doubt that the STS-103 crew is prepared for its task. That is a little short from our normal template in the shuttle business, but I think its the way well be going in the future so its kind of nice to maybe break some ground here and try to make sure we can be the most efficient we can, between the beginning of training and launch date, Brown said. So, thats the challenge, and I welcome the challenge and weve done quite well so far. Hubble was launched aboard Discovery on April 24, 1990, and deployed during the STS-31 mission. The first servicing mission took place in December 1993, with the second servicing mission in February 1997. The last servicing mission is currently planned for 2003. STS-103 is scheduled to conclude with a landing at Kennedy Space Center on Dec. 18. This will be the 96th Space Shuttle launch and the 27th flight for Discovery. Foale, whose last flight included a docking with theLed by commander Curt Brown, right, the crew of STS-103 makes its walkout from the Operations and Checkout Building on Nov. 17 before taking part in a Terminal Countdown Demonstration Test at Launch Pad 39B.Russian space station Mir, looks forward to a different perspective this time. At 317 nautical miles above Earth, Foale and his crewmates will have a lofty vantage point during the mission. I know that the Earth will look a bit more round; itll look a bit more like the ball that the Apollo astronaut showed us that captivated me when I was a boy, Foale said. So I want to go high, I want to see the Earth high, and Ive always wanted to be on a Hubble flight because it goes high, it goes about as high as a shuttle can go. John F. Kennedy Space Center Managing editor. . . . . . . . . . . . . . . . . Bruce Buckingham Editor. . . . . . . . . . . . . . . . . . . . . . . Gary White Editorial support provided by InDyne Inc. Writers Group. NASA at KSC is located on the Internet at http://www.ksc.nasa.govUSGPO: 533-128/00020Spaceport News Spaceport News is an official publication of the Kennedy Space Center and is published on alternate Fridays by the Public Affairs Office in the interest of KSC civil service and contractor employees. Contributions are welcome and should be submitted two weeks before publication to the Media Services Branch, AB-F1. E-mail submissions can be sent to Gary.White-4@ksc.nasa.gov SPACEPORT NEWSNovember 26, 1999 Page 6 When the Terra Spacecraft launches next month from Vandenberg Air Force Base in California, a rumble will be felt at Kennedy Space Center. The launch, scheduled for mid-December, puts KSC in the role of launch site support management, a function of KSCs designation as lead center for Expendable Launch Vehicles. KSC will conduct launch operations under a contract with Lockheed Martin Astronautics. Terra represents the next generation of atmospheric satellites, following the tradition begun in the 1960s by NASAs Television Infrared Observation Satellite (TIROS-1). New satellite and computer technologies now make it possible to study the Earth as a global system. Terra is part of the Earth Observing System, which will gather data needed to help scientists understand the complex links among air, land, water and life within the Earth system. Originally called EOS AM-1, Terra serves as the flagship in a series of EOS spacecraft. It carries five state-of-the-art instrument sets with measurement and accuracy capabilities never flown before.KSC gears up for Terra tional Scientific and Technical Contributors. KSC as a whole captured $140,000 in Space Act Awards for the 1999 fiscal year, finishing ahead of the Jet Propulsion Laboratory, which had ranked first for the previous 16 years. Overall, KSC placed fourth among NASA centers, with Goddard Space Flight Center leading the way. 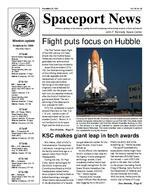 The total represented an increase from the previous high of $97,000 in awards KSC received for the 1998 fiscal year. In addition, KSC led all centers with 65 software releases, a new Agency record. KSC has been knocking itself out to reshape itself as an R&D powerhouse, and its starting to get that recognition, Curto said. (Center Director Roy Bridges) has been talking about wanting to do that for some time, so there you go its working. This is good, solid evidence of that progress. The Space Act AwardsAwards ...(Continued from Page 1) program was set up during NASAs formation in 1958 as a way of encouraging technological innovation among employees. Awards are automatically given to workers who are published in the magazine Tech Briefs submit an application for a patent or have software officially released by NASA. In addition, the Invention and Contributions Board offers board action awards of up to $100,000, the third-largest scientific prizes available in the world. Those awards are determined by a process of peer review, with Curto presenting the case for each employee. KSC surpassed its previous high by receiving 19 board action awards, which yielded $81,400 in prizes for employees. Curto noted that NASA Administrator Daniel Goldin receives summaries of all awards of $1,000 or more. This recognition from Headquarters is fantastic news for KSC, Bridges said. These awards show that we have made substantial progress in increasing technological development at the Center. I congratulate the award winners for their innovative ideas and dedication. Curto said KSCs number of software releases was particularly impressive. Thats absolutely stunning, Curto said. Theres a lot of good stuff going on here. The technology for which Helms earned recognition is actually 20 years old. The system, in use since the first Shuttle launch, detects leakage during propellant loading in several crucial areas around the orbiter. Helms said that the system on three occasions has found leaks that halted potentially dangerous launches. Its nice to know something you designed and developed has saved peoples lives ... at least once and possibly several times, Helms said. Helms already has plans for the $10,000 check from NASA. An amateur astronomer, he plans to use the money to buy a telescope.Stationary object arrivesWorkers adjust the connection of the port-side P3 truss on its workstand in the Operations and Checkout Building on Nov. 17. The truss, a segment of the International Space Station (ISS), is scheduled to be launched on mission STS-115 in 2002 aboard the Space Shuttle Atlantis.